Our family has been a huge fan of The First Years brand since my son was born. As a new mom I had trouble trying to find the "right" brands for me. There had been recalls and warnings on a lot of brands that I read about and other moms told me about. 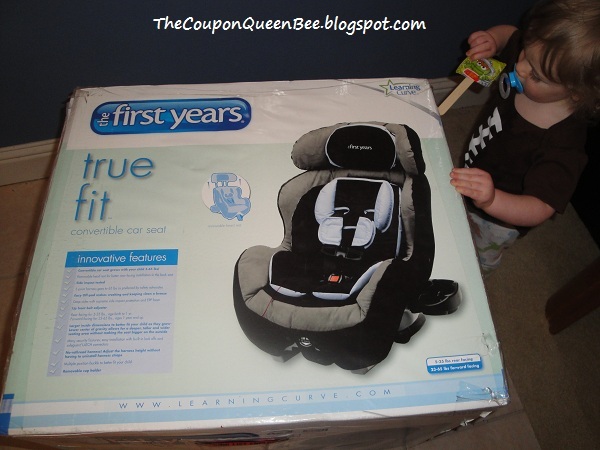 But one brand stood out to me as good quality at a reasonable price, The First Years Brand! 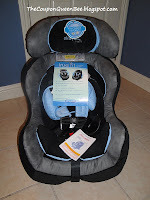 We have a feeding chair, stroller and now a car seat made by the company. I have to say they are all very durable and we are rough on our stuff. I love the colors that their products come in. I like having dark colors for items my son will use a lot to hide the messes but also I just enjoy darker colors. 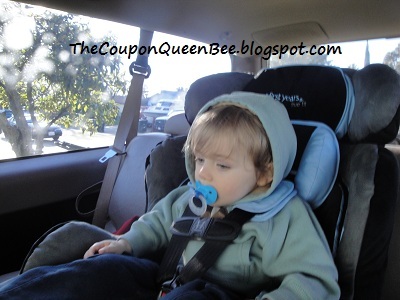 That is why I loved the Misty Morning car seat I reviewed. It is shades of dark with a splash of baby boy blue! The colors match my shoes I wear most of the time exactly! I know its odd but I really love that lol. The colors are not the only thing that I LOVE about this car seat. With safety items the rating and ease of use are very important to me. I was a bit worried about turning around my sons car seat to have him front facing. I read so many things about how he was best in rear facing as long as I could have him that way. We had him rear facing until he was just about 15 months old. He could not take his legs being bent and not being able to see what was going on. He screamed and would throw his binkie when I put him in his old car seat. As soon as he went for his first ride in his First Years True Fit car seat he was a happy boy!! He looked like such a big boy sitting in it and he has not been mad about car rides since the switch. Detailed labeling made it super easy to install! It was very easy to install. I read the directions and followed them with ease. The True Fit car seats have a 5 star rating for ease of use and I totally agree with it! Its labeled well in the seat to know how to install it and where to place the seat belts. We have a two door SUV and I easily got it into the back seat and safely installed. The car seat is so snug there's not even a wiggle of the slightest. I know he is in there good! The 5 point harness keeps him securely in the seat. The best part is the easy to adjust harness latch. Just one lift of the latch and I can adjust the straps. This makes it a million times easier for days he needs a thick coat to the days where he doesn't have one on. Our last car seat would drive me nuts trying to adjust the straps for when he was wearing different things. I also love that the car seat is a convertible one and when we have another child the baby can use the seat in the rear facing position. One of the best things is its very affordable! 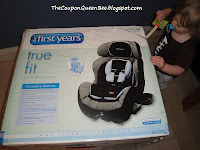 I have seen car seats over $300 that are not as highly rated as the True Fit First Years seats. 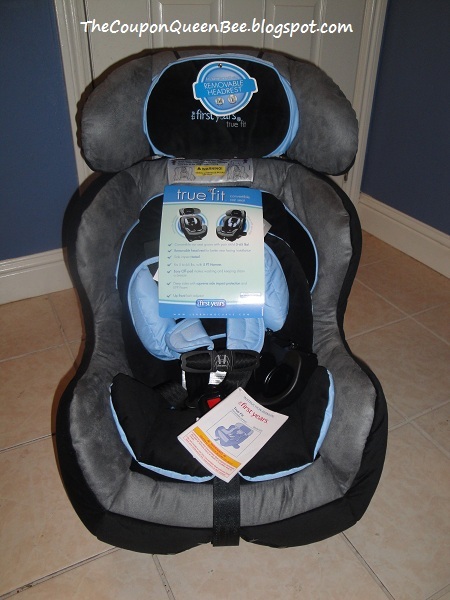 You can get the True Fit car seats at Walmart, Target, Babies R Us and online at Amazon for less than $200! Its a great deal for a seat that you will use for many years. It can hold a child up to 65 lbs and 50 inches tall. I am a facebook fan of The First Years Brand and a twitter follower and you can be one too! They have contest, discounts and info on new items. I was never a brand loyal kind of person until I had my son and had to realize the value of finding a great brand and sticking to it! I made a little video but I guess I shot it in too high of a resolution because the uploader said it is too large! Not sure how to shrink it, if I do figure it our I will upload it! I really like this review. 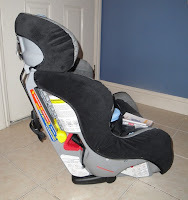 I've been looking for a car seat for my baby boy who has pretty much outgrown his infant seat. This looks like a great seat! Thanks for the review. I have a new grandbaby on the way and we need another car seat. This looks like one I should go look at. I have a baby that I will have to keep this carseat in mind for! Thanks for the review! I have always liked The First Year's products. We used them for my first son from infant seat on up. We are planning on ERF as long as possible and I like the weight limits on their products as well. Thanks for writing a review on them! You can really appreciate a car seat that is easy to use. That is so important. I love the colors also! You can't beat the great price also! I am glad to hear this was easy to install. That is what I am most afraid of when I get ready to shop for one of these! Great review. Thanks for the info. It's hard to know what's what til you find someone you trust to tell you the ins and outs of things. He looks super happy being a big boy now. Lol.